The Doctor smiled as he reached to switch on the viewscreen. “Susan,” he said, reaching out his hand to her. “Come and look at this.” She crossed the floor from where she sat on the sofa and came to his side. He pointed at the viewscreen. She stared, open mouthed, at the planet the TARDIS was currently orbiting. It looked like a coffee and cream coloured marble. Strata or layers, or stripes, she wasn’t sure what she should call them, bled their colours into each other. A moon that was tiny by comparison looked, she thought, like a malteser, and as their orbit brought them around the planet to the daylight side she looked at a sun that burned a deeper yellow-orange than the Earth one. He had done more than programme the co-ordinate, in fact. He had pre-programmed the whole landing. All it actually needed was for her to turn the handle and it initiated the fly-by-wire landing. But he knew she would get a kick out of having her hand on the controls as the TARDIS began to descend through the atmosphere towards the planet. “Just a little,” he said. “Slide the switch to the right of your left hand. Move it two notches down, not too fast, just glide it down.” In fact, the deceleration was also programmed. If it wasn’t, though, that was exactly what she would have to do to slow the TARDIS down enough so that they didn’t plough straight into the surface of the planet and keep on going till it reached the molten core. Or maybe just landed with a bit more of a bump than usual. Slowly, but not as slow as Susan thought it should have been, the planet’s surface came closer. She saw what looked like a very futuristic city covering several miles of the surface directly below them. It seemed to have a lot of tubes running around it like the biggest water slide in the universe or something. But she didn’t have much time to admire the view. She followed The Doctor’s instructions, pushing this lever, sliding that slide, as the descent gradually slowed and the TARDIS landed with only the slightest of bumps. “Are we’re where we should be, then?” she asked. “We’re at the exact co-ordinate that was on the ticket,” he told her. “Hang on. You can hold it.” He looked in the pockets of his trousers, jacket and finally his big tan coat before he found what he was looking for. He handed her a big ticket made of gold-coloured foil that immediately put her in mind of the golden tickets from Charlie and The Chocolate Factory – as if landing on a planet that looked like a big ball of chocolate wasn’t enough of a cultural reference. “We’d be able to recite the alphabet without getting an annoying song stuck in our heads for hours,” Susan retorted. The Doctor laughed and congratulated himself. Susan was going to prove to be a GREAT travelling companion. She thought like he did. “Did you ever wonder WHY they say that,” The Doctor added as he slipped his coat on and passed hers to her. The Doctor smiled at her as he opened the door. Yes, she thought JUST like him. “Could be,” The Doctor said. “B’Tallia Vance is a very strange character. Multi-trillion-billion-millionaire eccentric. Nobody’s seen him for about thirty years but his company keeps on buying economically unviable planets and turning them into booming businesses. This must be his latest project.” He looked up at the sign, too. He smiled. It operated using a similar kind of psychic projection as the TARDIS itself – feeding off the individual’s brain patterns and translating into their native language. Susan saw “Welcome to WonderPark” in English. He saw it in the beautiful, swirling hieroglyphs of High Gallifreyan which as well as bringing a sentimental lump to his throat, did him the favour of removing the unnecessary capital ‘P’ from ‘WonderPark’. He was in full agreement with Susan’s former English teacher about that. He was just wondering where they went next when a series of arrows lit up, pointing them to something that looked like a car from a roller coaster ride, except that it was suspended above three inches of air on an anti-gravity strip running along the floor. The strip continued towards a dark tunnel just big enough for the car to pass along. There was one long seat. It was one of those where the tallest person sat at the back and got squashed by all the shorter people in front. The Doctor grimaced and stepped in first before helping Susan sit in front of him. She gave a slight gasp of surprise as an anti-gravity cushion pressed her gently back against him, serving as a safety belt. “I hate HEIGHTS,” he said. “But I LOVE roller coasters.” The countdown reached zero and the car began to move. As he might have expected, they began to climb once inside the dark tunnel. The Doctor felt Susan’s bodyweight pressing against him as the angle steepened and they slowly reached the sort of height that would have made Earth roller coaster fans weep for joy. He felt a moment of panic. After all, the invitation WAS a bit mysterious. He really wasn’t sure what he had got himself and Susan into. He thought of all the people in the universe who had a reason to kill him, and wondered if any of them were mad enough to try death by white knuckle ride. Too late now, he thought as the car levelled out momentarily and then began to descend. His own and Susan’s screams of terror mixed with excitement echoed along the tunnel as they flew along it at a speed he probably could have calculated if he was not too busy screaming. Their stomachs churned excitedly as the car levelled again and then went up the next incline under the momentum of the first drop. Halfway up they emerged from the dark into bright sunshine and when their eyes adjusted they were both amazed to see that they were racing along inside what looked like a glass tube suspended high above the WonderPark below. They caught brief glimpses of buildings and green places and water as they descended rapidly again into another dark tunnel. This time they descended for a very long time and when they again saw light ahead it was a greenish, diffused light and they emerged into an underwater world. Exotic marine life flashed by too fast to really get a good look at it before they climbed again into darkness. “This is COOL!” Susan said as they wondered what was going to happen next. “Yeah,” The Doctor agreed. His fears seemed to be unfounded. It looked like it WAS just a fun ride, after all. He relaxed a little and enjoyed himself. It wasn’t often, after all, that he got to DO either of those things. The makers of Earth’s biggest roller coasters would be weeping before the journey was even halfway done. It went on for miles of undulating tubes, sometimes out in the open, sometimes in darkness, sometimes in that green underwater world. There was one rather annoying bit with flashing disco lights that they were both glad to get through. Then for a very long stretch they seemed to be travelling down through rock strata and The Doctor started to wonder about that molten core of the planet again. But they climbed again and shortly after they came to the end of the ride. “Wow!” Susan said as the anti-grav cushion released her and she scrambled out of the car. There was a whirring noise that disturbed the quiet of the corridor. “What on Earth is that?” Susan shrieked as what she took to be a large computer server or a radiator, or something, suddenly moved towards them. A red beam of light emitted from an ‘eye’ in the front of the metal unit. “Present your ticket,” a metallic, synthesised voice said. Susan looked at The Doctor who nodded to her. She stepped closer and held up the ticket. It scanned it and then scanned them both. “What do you mean, mythical,” The Doctor replied. There was something about the robot that put him in mind of K-9. The voice, the way it moved. But K-9 had more style. He was a dog shape, for a start. Not a radiator on hoverpads. “I am a design of Professor Marius,” the robot answered. “I am a Robotic-Individual-Companion,” it answered. “I am your tour guide,” Ric answered. “Cool,” Susan said. She had just about kept up with the conversation between The Doctor and the ‘radiator’. Later she would have to ask him exactly what a K-9 was and why The Doctor was so excited. But a robot that looked like a radiator that was called Ric definitely sounded cool to her. “WonderPark is an exciting new venture in Edutainment which brings the greatest architecture and natural phenomena of the twelve galaxies together in one beautifully landscaped park for the enjoyment of the visitor,” Ric answered. The Doctor almost expected him to have a cue card to read from. That was SUCH an obviously prepared piece of spiel. “Transport awaits,” Ric said as the corridor widened out into what could only be described as a landing stage beside an indoor river. A rather attractive boat in the style of an Arabian Dhow lay at anchor there. There was no crew. It looked like a sailing dhow, but that seemed to be just for show. The boat began to move, apparently of its own volition, at a gentle pace. Susan leaned back on the seat happily. Opposite her The Doctor stretched his legs. This wasn’t so bad, really, though he kept on wondering when something sinister was going to happen. “What does ‘Transporter Portal’ mean?” Susan asked. She was facing forward, looking where they were going. The Doctor turned and looked. The river was heading through an archway with those words illuminated above it. The air within the archway shimmered. “No kidding!” Susan looked around her. The boat was sailing gently between two banks in the open air. On the banks was some very impressive architecture. The Doctor looked at it in amazement. And yet, he thought, as he looked at what he assumed was a faithful copy, he could see that 1,200th floor and see it in close detail. In fact, with his eyesight he could do that anyway, but there was something about WonderPark that extended that Time Lord gift to everyone. He showed Susan how to focus her eyes and she gasped as she looked at the friezes beneath the windows depicting mythological creatures of Beta-Zed. The boat slowly passed the Tower and they viewed the Beta-Zed volcano, the Lutanium Dome of Beta-Zed III’s Great Temple, the triple-peaked mountain of Goll, and the Numian Sand Eddy, a permanent whirlpool in the desert, constantly sucking down and spinning the sand around, along with anything and anyone daft enough to get too close. “Wonder-Zone Two features the famous sites of Fallapatorius,” Ric answered just before they passed through the portal. “What’s he great for?” Susan asked. “Outlawing cannibalism on the Raxacoricofallapatorian home planet,” The Doctor replied. “Ok.” Susan decided not to ask any more questions. The Doctor decided not to answer any more for now. He looked at the sites with interest, though. As much as he disliked the species from that long-winded planet, he had always admitted that it was a beautiful place, and leisurely viewing its finer features without having to meet any of the indigenous population had something to commend it. They passed through several more interesting Zones and Ric gave the standard commentary about them while The Doctor filled in with amusing, terrifying or just plain fascinating anecdotes. “Entry to WonderPark is 300 credits per person, concessions for elderly, children, disabled, and species with less than three limbs or more than one head,” Ric answered dutifully. The next zone was a little harder for him to view dispassionately. He swallowed a lump in his throat as Ric announced they were now visiting Kasterborus-Wonder-Zone. “Where’s that?” Susan asked as she noticed that the sky seemed to have been tinted slightly yellow and that the sun here had a reddish tinge. “Two hundred and fifty million light years from Earth,” The Doctor said. “As the space-bat flies. It’s… It WAS my home.” He looked around slowly at the replica of the Citadel of The High Council from Gallifrey’s Capitol, at the Dark Tower, home to the Tomb of Rassilon, at the Library of Flavia, at Rassilon’s Obelisk. “That looks like a giant Toblerone,” Susan said of the monument to the legendary Creator of the Time Lord people. The Doctor laughed and agreed. Only somebody from Earth would have made that cultural connection and only a non-Gallifreyan would have dared to be disrespectful to any relic of Rassilon. “Nice mountain,” Susan continued and The Doctor really had to keep his emotions in check as he told her it was Mount Lœng, the mountain near his own birthplace in southern Gallifrey. The special vision effects allowed him to show her close up the waterfall that fell sheer down almost half of one side of the mountain, and the monastery perched by a precipitous drop almost at the peak. “Which was….” Susan prompted him. “Patience,” he replied. “Mind you, I still hate to be kept waiting. But they did succeed in teaching me to sit still and fully appreciate slow but beautiful events like a caterpillar turning to a pupae and then to a butterfly or a single blade of grass growing from a seed.” He sighed as he cast his mind back to the simpler days of his youth. A long time ago. Susan’s mind was approaching culture overflow as she stared at two of the tallest man-made structures on her planet flanking one of its most famous mountains. She listened as Ric told her that the mountain was three hundred and forty metres high, the tower a mere three hundred and twenty metres, but the Empire State Building three hundred and eighty metres and she looked at how the building was head and shoulders above the mountain. “But it doesn’t look right putting two buildings next to something NATURAL,” she complained. “I agree,” The Doctor agreed. “I’d re-arrange things a bit. “Although, THAT’s very nice!” He looked up as the boat passed under the Golden Gate Bridge, followed closely by Tower Bridge, Sydney Harbour Bridge, The Forth Rail Bridge, the Brooklyn Bridge, the lovely Sio-Seh Pole Bridge of Iran, and for some strange reason the concourse of Newport Pagnell Motorway Service Station. “THAT’s a wonder of Earth?” Susan laughed. Susan had to agree as they passed on both sides the great architectural wonders of Egypt. The Great Pyramids and the Sphinx on the right, and on the left the Temples of Karnak and Abu Simbel. “Purchased?” The Doctor yelled angrily. “Nobody PURCHASED Mount Lœng. That belonged to my family. And they’re all DEAD. 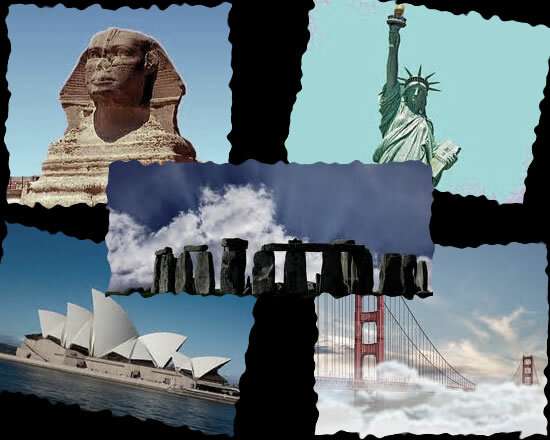 As for THAT….” He stood up in the boat as they sailed past the Egyptian section and he stared at Stonehenge perched on top of the Grand Canyon, while on the other side of the river the Statue of Liberty was parked in front of Mount Everest. Susan gave a gasp of amazement as The Doctor suddenly jumped out of the boat. She didn’t know how deep the water was, but it didn’t matter. He moved so fast his feet just skimmed the surface. She was sure as he reached the bank that his white canvas shoes were only slightly wet. “Stop,” she cried. But it was too late. They were already heading towards the arch. The Doctor hadn’t noticed. He was running towards the base of the Statue of Liberty. He looked at the bronze dedication plaque and smiled wryly at that often quoted inscription. But now, Liberty seemed to be a lost soul, too. He held up his sonic screwdriver and took a reading that confirmed this WAS the genuine article, the real Statue of Liberty. What was she doing HERE? What WAS Going on? 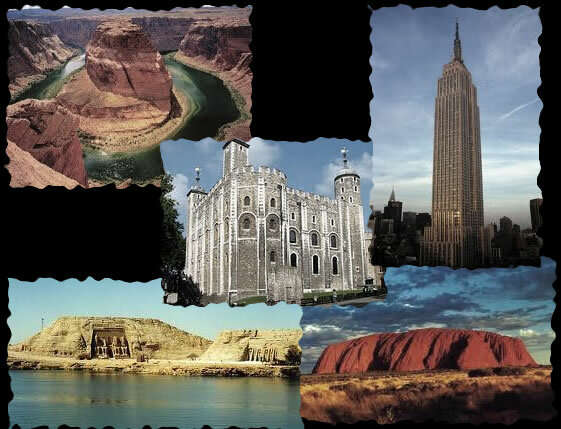 What were ANY of these monuments and mountains and waterfalls doing here? He looked around. The boat had gone on through the next portal. If he was going to follow it he was going to have to get his feet wet. Or maybe not. He adjusted the sonic screwdriver again and aimed it at what seemed to be thin air. Maintenance portal! He stepped forward and felt his ears pop as he was transported. “Doctor!” Susan flew at him as he steadied himself from what WAS a slightly nauseating few moments. Maintenance portals, designed for use by servo robots didn’t have the same inertial dampeners as those intended for organic lifeforms. He looked. This was, apparently, the end of the boat ride. Susan had been waiting on the landing stage for him to arrive before going on through the next doorway. He looked at the next doorway. He saw the words “Doctor Zone” in Gallifreyan. And as he approached, Susan holding his hand and Ric hovering along by his side, he saw a familiar shape on the other side of the door. The blue light illuminated a patch of the darkness and the word ‘Police Public Call Box’ shone out like a beacon. “I think it’s part of the exhibition,” Susan whispered. “Doctor, IS that the real TARDIS?” Susan asked. “Stolen,” The Doctor retorted. “Who ARE you?” He looked at the woman. He had seen a great deal of the universe and was familiar with many species and so he was fairly confident that this WAS a woman. In a universe of infinite variety a six-foot five woman was not impossible. Not even one in a figure hugging red satin dress which left NOTHING to the imagination, especially around the low cut top which he was studiously avoiding looking at. “I am your host, B’Tallia Vance,” she replied. But he had no intention of being taken alive. His own sonic screwdriver had identified one portal that wasn’t being blocked by a slowly encroaching servo robot. He grabbed Susan by the arm and ran for it. “Good gracious!” a voice said as they emerged into a room that had quite a lot in common with the TARDIS console room except that it lacked any kind of individual character. He turned as he heard a noise behind him. Ric had followed them through the portal. As soon as the little robot was clear he aimed the sonic screwdriver at the patch of air. A deadlock seal with a 24 character unlock code bought them a few minutes respite. There was no physical door to this room. It was round, with a domed roof and walls that were smooth and white. There was no obvious way out. He took all of that in before he looked at the man who was standing by the console that took up so much of the floor space. “B’Tallia does,” Marius told him, glumly. “I’ve been here five years. Hardly left this room, not even to sleep.” He nodded towards an unmade bed in the corner of the room and a screen that concealed some kind of rudimentary bathroom facility. “This is the control room?” The Doctor asked, examining the console. He looked at a screen that showed Liberty Island with a big hole in the ground where the statue should have been and some very puzzled people examining it. Another showed the Parthenon in Athens, still intact, but there was a strange glow around it, like bad chroma-key from the early days of television special effects. Clearly that was going to be the next addition to B’Tallia’s collection. “So if you did it, you should be able to undo it?” Susan asked him. “I serve my Master,” Ric said. And The Doctor thought that was so very much like K9’s logic. “Come here for a start,” The Doctor said. Ric came to him dutifully. He knelt beside him and pulled his side panel off and looked carefully at his inner workings. He used the sonic screwdriver to alter some of his settings before closing the panel again. “What have you done to him?” Susan asked as she helped Marius put the Statue of Liberty back where it belonged and moved on to the Taj Mahal. “Affirmative, Master,” Ric said. The Doctor looked at him and smiled. “Good boy!” he said. He adjusted the sonic screwdriver and got ready to open the portal. Ric placed himself in front of The Doctor and moved through the portal first. By the time The Doctor reached the other side Ric had taken out two of the servo robots and was in the process of zapping another. B’Tallia Vance looked as if she had been trying to use one of them to break into the TARDIS. The pincer arm was hammering against what appeared to be an ordinary wooden door. But it hadn’t even scratched the paint. Of course it hadn’t. Good old TARDIS, The Doctor thought proudly. Good old Ric, he added as he hit the servo robot with a laser beam that blew its central processor to pieces. Meanwhile he got hold of B’Tallia Vance in a none too gentle armlock. “I’m usually much nicer to women,” he said. “But seeing as you used to be a man and you tried to kidnap me, I see no reason why I should be.” He adjusted his grip on her and reached with one hand to open the TARDIS door before pushing her inside. “Yes, master,” Ric said obediently. B’Tallia Vance edged up against the console as he moved threateningly in front of her. The Doctor closed the TARDIS door and programmed it to lock in on Susan and Professor Marius in the control room. The Doctor seemed very distracted for a moment. Susan thought he looked very sad. He stepped out of the TARDIS and went to Marius’s control panel. He looked at the monitor showing the Gallifreyan monuments still in the WonderPark and the rejected co-ordinate. He typed in another co-ordinate. One that he knew by heart although he would never programme it into the TARDIS navigation console. He hesitated a moment, tears pricking his eyes, before he sent the Citadel and the Dark Tower, Rassilon’s Obelisk, and Mount Lœng into the black hole where the rest of his planet had been lost when the sun went supernova. That was the right and proper place for them. When that was done he turned and went back into the TARDIS. He looked at Marius. “We’ll give you a lift home in a minute, professor. First, I want to show Vance something.” He beckoned to her and she edged around the console as Ric kept his red eyelight fixed on her. The Doctor typed rapidly on a keyboard and figures came up on the monitor beside it. “Do you know what these are?” he asked Vance. B’Tallia Vance beat a hasty retreat. The Doctor closed the door and turned to the console. “Right, next stop Titan for the Professor and Ric,” he said.